Street art didn’t fare so well in Milan. 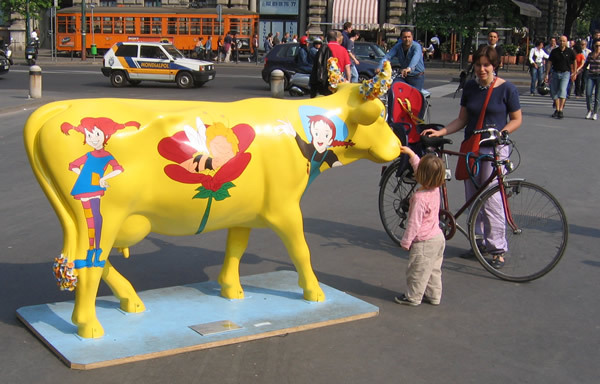 The newspapers reported that Milan set a record for the number of cows vandalized, particularly during the night that the AC Milan football club won the European championships for the seventh time. The poor cows were variously burned, thrown into a fountain, or simply taken away. They had been intended to be sold to raise money for charity. Alternative ways to raise this money are now being explored. Here are a few I managed to salvage photographically. This entry was posted in Italy travel and tagged art, Milan on June 20, 2007 by Deirdre Straughan.